Although the content is suppose to focus on the advantages of good condition monitoring, but pay attention to how maintenance parameters such as criticality, priority and frequency changes dynamically. Notice also the flexibility and adaptability of their system to cope with the dynamism. That is what I would consider a World Class Maintenance practice. 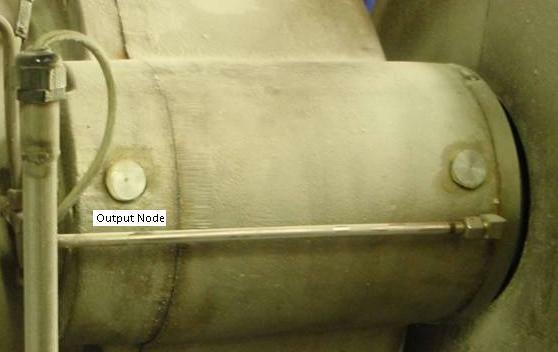 A recent acoustic emission (AE) study identified a potential critical bearing failure that became a planned preventive action for a leading food manufacturer. This also avoided considerable cost and unplanned downtime. The acoustic emission equipment and the main tool used during the planned inspection routes were manufactured by Holroyd Instruments. This example will show the value of this type of equipment in avoiding a major unplanned event that could have had massive cost consequences for the business. Collateral damage to the associated equipment would have proved very costly, and the lead time to rebuild could have caused extensive downtime that would have meant disgruntled customers not being able to rely on stock availability. The story began in April 2010 when some initial elevated readings were noted at two node points on a large step-down transfer gearbox that were sampled on a seven-day routine. The distress readings were elevated and triggered the alarm level. They were of concern and evident on subsequent inspections. The third elevated reading that was part of an upward trend instigated a planned work order in the computerized maintenance-management system (CMMS) to investigate and take further action. This equipment could not be taken out of service lightly, as it was at the time constrained by high production demands. Experience with a sister line’s previous planned bearing change also played an important part in the escalation of the risk. The input side of a transfer gearbox is shown with the output bearing node point on the left-hand side. On more detailed inspections, it was determined that the bearing with the highest distress was indeed the suspected output bearing. Audible clicks were loud and clear at the output end bearing. The two bearings at the node locations were on the drive line of the motor at the input and output ends of the transfer gearbox. The adjacent bearings on the large, helical step-down gear were still reading low and had no audible clicks. The engineering manager was advised that there was an anomaly on one of the input bearings, that the others were in good condition and that production could continue with targeted condition monitoring. The routine oil sampling was increased from monthly to every two weeks. AE inspections were increased, with spectrum readings now on a four-day cycle. This would give some comparative evidence when the new bearings were eventually fitted. The planned change of the bearing set was arranged with the production planner, maintenance manager and product specialist. It became clear that the equipment would have to operate for at least another six months until it became available. Contingency plans were formulated for an emergency change if any of the AE readings or oil samples showed advances toward failure. Warnings were issued that this could occur rapidly if the bearing failed. A new bearing set was purchased, and a meeting was scheduled with the bearing manufacturer to examine the used bearings when they were eventually changed in early 2011. The AE readings stayed at an elevated level during this long waiting phase, and oil sample results showed no elevated readings in the key elements associated with roller bearing failures. During the weeks before renewal, many spectra were taken from all points of the gearbox for future evaluation. This would rule out frequencies from the oil pump and other components around the assembly. An AE envelope spectrum graph before the bearing change is shown below. As can be seen, there was something creating a spike at 73Hz, which happened to match the frequency of the bearing race. This provided a clue that there was a race surface defect of some kind and not an element breaking down or the cage disintegrating. The bearing change finally took place, and the production plant was turned around within 12 hours so that the equipment did not incur any unplanned downtime. The used bearing set was returned with the transfer gearbox, and the two units were degreased. On first inspection, they both looked similar and in good order. The elements and cages were then dismantled from the outer and inner races, with care taken to keep them in order and in the correct aspect for reassembly later. It became clear that on the suspect output bearing, a major spall on the inner race had developed, and every element was pitted with the debris that had emitted. At this point, a representative from the bearing manufacturer was invited to visit and examine the bearings. He concurred that the bearings had lasted very well considering the atmosphere and heat in which they had operated for almost 10 years. This would be considered an end-of-lifetime mode of failure. It may have lasted many more months or could have accelerated to failure within days or weeks. The photograph below is of the spall that measured approximately 10 mm in length and 2.5 mm wide. Spall damage to the race is shown above with feathered edges and surface pitting in the loaded area of the spalling. Note the next layer of material on the right-hand side that would have given way. When the remedial work had been completed, additional spectrum samples were recorded and monitored to learn more. Carpet noise levels were lower, and the decibel scale was a third of the previous graph example. The maximum peak was now less than 0.4 decibels, while the carpet level was less than 0.2 decibels. In conclusion, the systems and tools relied on every day proved effective in capturing this anomaly before it turned into a major event. The key to this was the full involvement of engineering with operations to plan in the remedial work with as little disruption as possible. Among the lessons learned were that the inspection frequencies at seven-day intervals were correct for this critical plant, the preventive action was started at the earliest opportunity, the equipment enabled the pinpointing of the bearing fault, the audio facility allowed a second reference that linked rpm with the audible clicks and that this all gave sufficient evidence for the planned work to commence at the earliest opportunity. 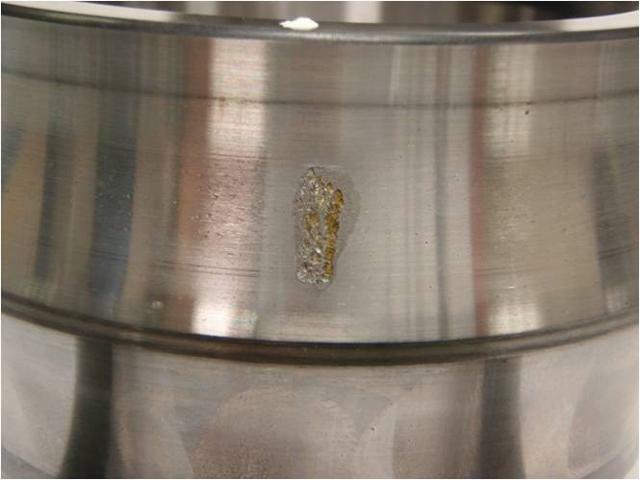 Root-cause analysis was carried out directly after the bearing change was completed to investigate any future recommendations for servicing this equipment. It was decided that as the bearings had reached their end-of-life cycle, there was no need to alter any future planned maintenance. Condition monitoring with AE had provided the confidence to pick up any anomalies at a very early stage in the curve.